This is Porcupine Mountain, an actual feature on USGS maps, though I don't know why it's a mountain since the top is just shy of 6,000 feet. However, it is home to our home. We've never seen a porcupine so I'm thinking the name comes from the shape. 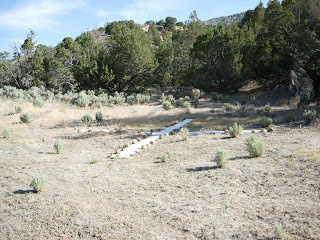 Does it kinda look like a waddling spiny mammal with the Juniper trees poking up here and there? When I walk the dogs in the morning I am astounded that here at the end of June there are still wildflowers. What sustains them though daytime temperatures in the 90s? This is Prickly Poppy. I tried using it as a dye plant last year - bad idea. It got it's name for a reason. Besides the color was insipid. 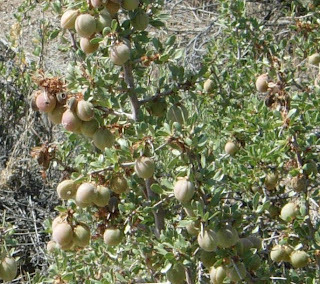 This is the desert peach, a member of the rose family, now in fruit. Because they are a favorite of tent caterpillars, many of the shrubs are coated in their webs. I was happy to see this one fruited out. Desert peaches - you can see how the plant gets it's name. I don't see birds eating them and I figure if they're not interested, I'm probably not either. These thistles are in a field at the south end of White Lake, a seasonal alkali lake on my drive to work . They're considered a noxious weed. I have never seen so many in one place as here. 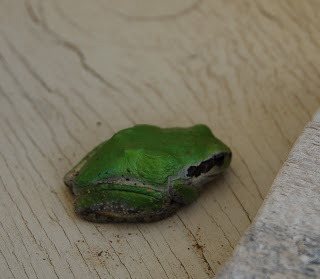 Ian noticed this morning that we had a visitor on the front deck. I hated to disturb him, but finally tonight I went back and moved his hidey hole for a better shot and then I put it back. He's a cute little feller. I met Lori for lunch today. I know exactly how long we've been friends. She was pregnant when they in moved across the street from us, and Jake just celebrated his 21st birthday. 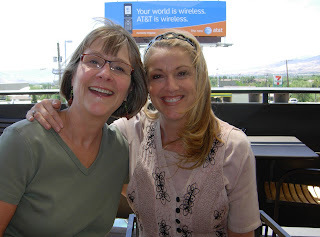 I haven't seen Lori in two years - Jake tells me that it was November 2005 when they left - he joined us for lunch. I always loved it when her parents came to visit - I'd come over and we'd play games for hours, share stories and laugh. Lori told me one day that when the boys went to college and the nest was empty, she and Joe were going to sell everything and take their boat, in a Bay Area berth, and sale around the world. And that's just what they did. Only when they got to Puerto Vallarta, they felt at home - for now she says. When the boys graduate, they'll think about it again. They have created a business out of day trips - Lori cooks and Joe sails. When I say that Lori cooks, all the years we would go to garage sales together, early in the morning with the boys and powdered sugar donuts - ugh - Lori would look for cook books. She loves to cook. She gave me a signed copy of the cookbook at that she ultimately wrote. Everyone knows that I don't cook, but my kids loved every recipe that I got from her. If it was good they'd ask, is this Lori's recipe?? Joe recently got his pilots license, they're looking at expanding into moving boats for other people. They're back now because Lori's good friend and ex-business partner is in a cancer center in California. Connie has never ever been able to kick the need for smokes. I know Connie and she's a young woman. Lori said the center has a gazebo area where the patients cluster to smoke. This hits home hard as my children's father was at the birthday last weekend. Only six months older than I, his health is failing dramatically from congestive heart failure, yet he would walk slowly to the driveway to have a cigarette. I can only say that I'm grateful it's not me. I made them pose for me - Chrissie and Jake - our children. Jake apologized for not remembering Chrissie as his babysitter - he was a baby after all. We all used to walk up to the Reno Great Balloon Race, an event that happened to be right behind our homes. I took bagels and cream cheese, Lori took some kind of baked exotic casserole. Her friendship is one of my life jewels. I told her the boat thing is a problem for my floor loom - good thing she doesn't want to weave. We had taken a drive when my youngest son was just a toddler and we were residents of the very warm Redding, California. He fell asleep and in that time we had left hot Redding and drove to a lake to the west at a higher elevation. We went from sweltering heat to the cool of a forest canopy. When awakened, he sat up, gazed around in wonder, "Where came this?" I have thought the same so many times in my life since then. Where came this? How time has flown. Just last night I realized that today was my one year blogiversary. Where did this year go - Where came this?! One year ago today I posted my first blog. It was a simple picture of four hats - no text. I hadn't figured out that part yet. A lot has happened for me in a year blogwise. Baby steps, as Sara says. I thought it on my drive to work today. What has happened in this year that wouldn't have happened were I not a blogger. 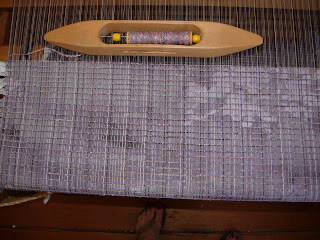 The first realization is that I wouldn't be weaving. 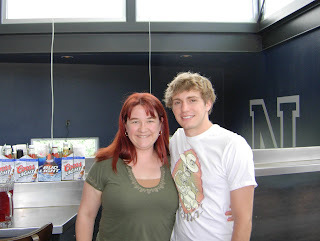 I would not have met Birdsong or Sara - we met first through our blogs. As the thoughts flowed and the miles passed, I realized that I was thinking in terms of community. I have a genuine, real, honest-to-god, community of blogs and bloggers that I engage with. While I haven't met Sylvia, Birdsong has - camped with her even. She has met Margene as well. 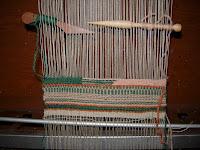 Probably the biggest single thing though is that I fell in love with weaving, thanks to Leigh, Sara and Marie. I'm weaving Leigh's ideas, almost, but since I can't count, it's the same, only different. 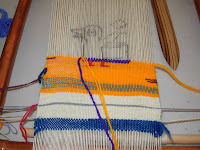 The hardest challenge in weaving for me is math. Jodi keeps me reading good stuff. I can keep in touch with Amy, my bestest friend, but still 35 miles away. Valerie is my Soul Sista'. Oh, and Marcy. If you don't already read her blog, just go stand in the freeway. I have Cindy to thank for awesome fiber uTube videos. Steph keeps it real and in color. I know that many of my friends read my blog - you tell me you do. 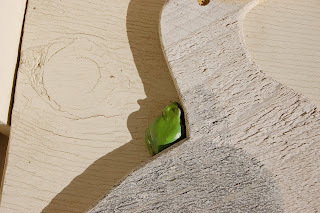 I encourage you to dip your toe in the blog pool. The water is fine. And here's a place to start. It's so easy that, if the math challenged wanna-be weaver can do, anyone can. 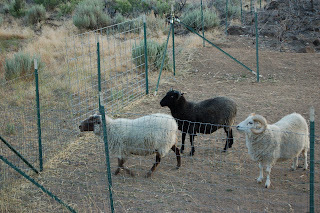 I was in the back of the house tonight and heard the sheep yelling their heads off. This is not a normal pattern so I hurried out to the back to see what on earth was going on. They were yelling at Ian - so crazy - so I ran back in for the camera. 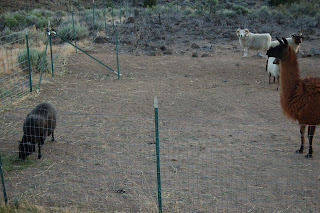 He apparently has gotten into the habit of pulling tumble mustard and throwing it over the fence for them in the evening. Actually, I think the habit is their's, given the intensity of their interest. He's just weeding. And they're happy to help. 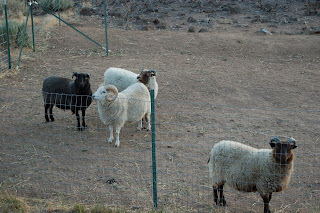 Frightened by their arch llama, the sheep have scattered, all but George, who thinks he's a llama. Zephie, one of the z-girls, is stunned. "You mean he's not a llama?!" 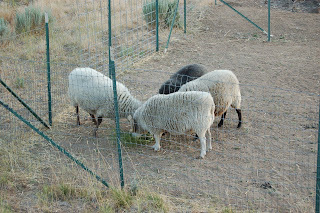 When the market is satisfied, so are the Sage Creek Farm critters. 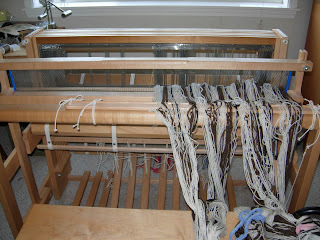 I have half of the warp on the loom and have run out of white. You don't have to guess what I'm madly spinning on every morning. This is my first time to use lease sticks. We used them in the beginning class I took five years ago but I've never used them on my own. I taught myself how to sley from my hand, using Deborah Chandler's book but never looked further in the chapter to see her explanation of how to put the cross on the sticks. Lindsey explained the advantages of using the lease sticks to me when we were at the Retreat. It makes dressing the loom from front-to-back all that more fun since I can stop and leave the warp ends to come back to later. Notice how short the sticks are - they belong to my 24" loom. Since I can't put all the warp on these at one time anyway, I've decided to go ahead and thread the heddles for this sleyed warp while I'm spinning more yarn. I've never done it from left to right, but it should just be a matter of getting used to. 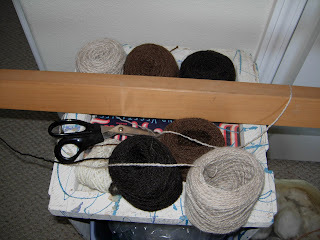 This is all the yarn that I have left. I like to put my warping board on top of this wooden box and lean it against the wall. It's much easier on my shoulder at this angle. 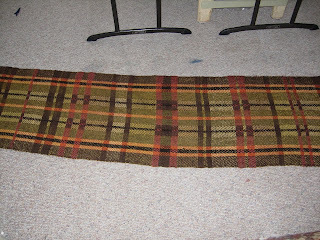 Even with the yarn shortage, it's a big relief to have the weaving in progress. 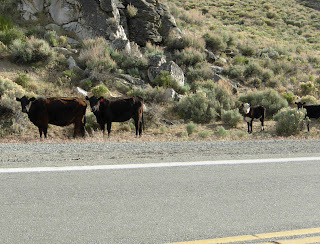 It's that time of year again when we have to pay attention for about five miles as the free-range cattle are out. Every year someone hits and kills one and every year I hope that someone won't be me. This Chica is out standing in her field - actually she's on the shoulder of the road. 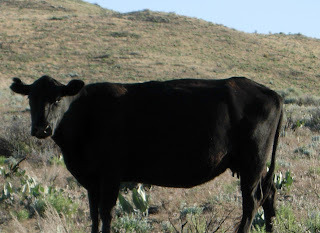 These are different cows - they all look alike, doncha know. They don't pay attention unless you stop, which I did, to take their picture. It's all quite pastoral and quaint, but not an ideal fit for drivers who think they're still on the freeway. I'm thrilled to see these California poppies, introduced by the birds flying over from where else but California, and so far in our valley seem to only be at the top of our property. 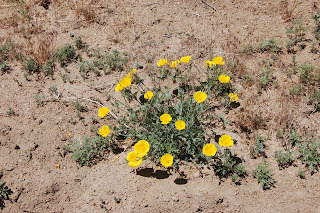 It seems impossible when daytime temperatures are in the 90s that wildflowers can flourish. 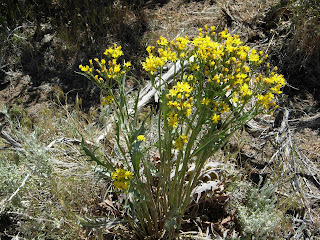 This is a member of the composite family, but then many of our wildflowers, I mean weeds are. 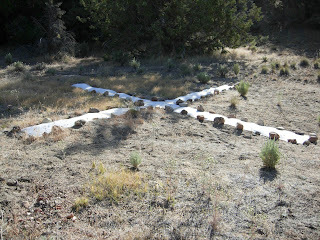 They add color to an increasingly dry landscape. 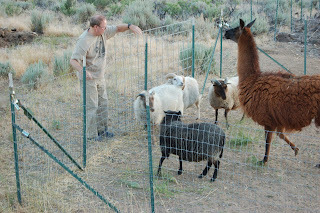 Mim came over for a while today for a little fiber sharing since we didn't get to go to Black Sheep Gathering like many of our friends did. 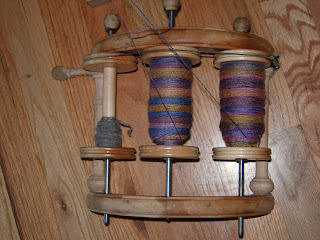 Mim showed me the skeins of silk/Shetland that she blended on her electric drum carder, then spun. She left with my copy of Hats, Hats, Hats to see if she can create a hat pattern for these skeins. This is what I'm currently working on. 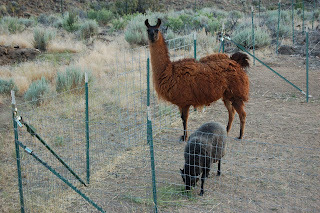 I bought the fiber at Oregon Flock and Fiber Festival last year. 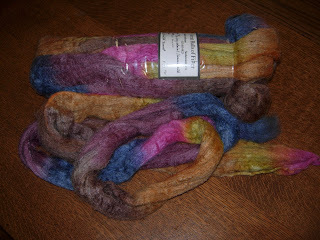 It's from Great Balls of Fiber and is dyed by Sarah Anderson from Snohomish, Washington. The fiber is 70/30 gray colonial/tussah silk and I have about 12 ounces of it. The color pathway is Painted Desert. 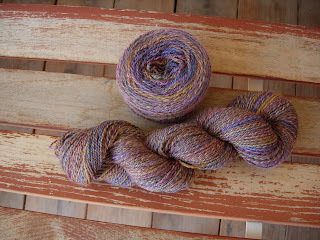 I'm plying the skeins and they seem awfully bright for any desert things I've seen. But then I'm the person who owns a couple dozen khaki or putty pants and wear them with white shirts. This is Painted Desert in Skeins and clearly not as bright as I had first thought. Time to swatch. All the time I'm wondering why I didn't buy more than 12 ounces. What does 12 ounces make?! What was I thinking??!! Even with the flash, you can see the colors and they do indeed reflect the painted desert. The fiber has been a pleasure to spin and I'll be keeping an eye out for this vendor in the future - no web presence unfortunately. 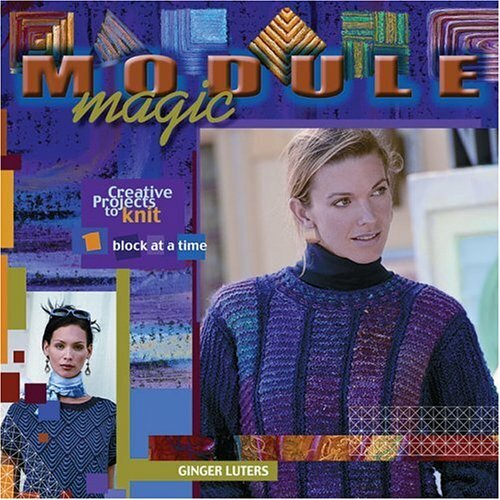 I decided last weekend that the solution would be a modular sweater from this book. Ginger was my assigned roommate at the retreat. When they told me she had written a modular knitting book, I was worried. I had seen a modular knitting book recommended on one of the blogs I read. I got from the library and did not care for it at all. So I felt like I was seeing my friends new baby and thinking, "Would you like a banana for your monkey?" One day Ginger wore one of her short-sleeved sweaters and it was lovely. It had shape and drape. I asked her about her book and I realized I was thinking about the wrong one. I've ordered a copy from Amazon and been spinning while I wait for it to come. I'm sure my yarn will shine in a modular format. I'm not a fan of stripes that can come from rainbow-dyed yarns. I spent some time today starting to get the warp on my loom for my lap robe and realize that I have a huge deficit of yarn needed. I thought I had enough yarn spun up, and I do - for warp. 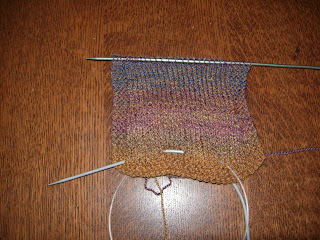 So this Painted Desert project is on hold once I ply off my current spinning. It's time to spin weft. Ugh. We've had the pleasure of family this past week. 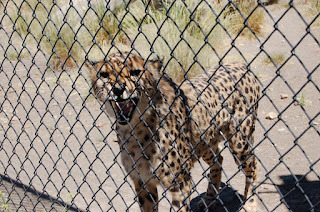 Ian's daughter and granddaughter are resposed at Animal Ark where they spent two hours yesterday. We have no pictures of Paul - he's the cameraman. 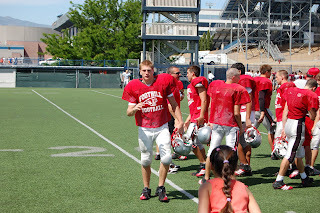 They're staying with us, because son Dustin is at football camp for the week at the University of Nevada, Reno. Margi is backing up so fast that her hair is in flying forward. And this is what she's backing away from. 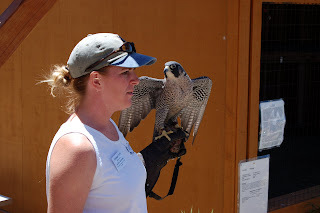 Animal Ark is an educational facility, about twelve miles south of us. 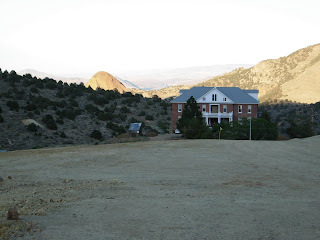 A visitor to Reno should consider a visit here as an alternate to the other more publicized haunts, like casinos. Two bus loads of school children were visiting at the same time as our kids. Maps are available for self-tours and staff provide informed lectures. Paul was telling me this morning that the Peregrine falcon plummets from the sky like a rock, hitting it's bird prey, knocking it senseless. It's then able to pick it up from the ground and fly off for a leisurely meal. 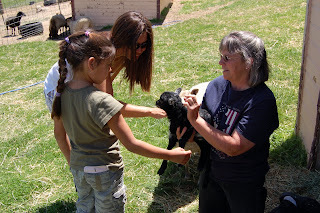 Our eight-year-old granddaughter loves animals and has an uncanny Dr. Doolittle sense when she's around them. I called my neighbor Mim on my way to work to see if the kids could pay her a visit. 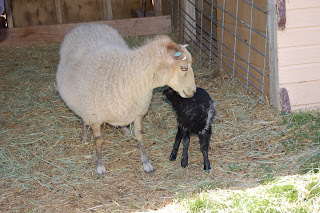 She said that she had a new lamb and would be home, so I called Margi to let her know. Aren't cell phones wonderful?! 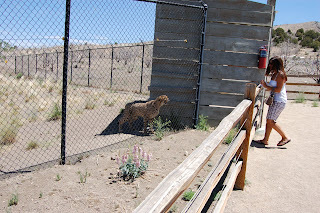 Within the space of about 30 minutes, Sissy went from snarling cheetahs to petting a gentle lamb. She had a full day and I'm sure will remember most of it for a long time to come. This is Dustin, the reason for the visit, breaking away after scrimmage to come over to visit his little sis who is running to him. I love this picture. Margi's son CJ is at football camp in Oregon this same week. Think of your grocery bill, then double it for their household. 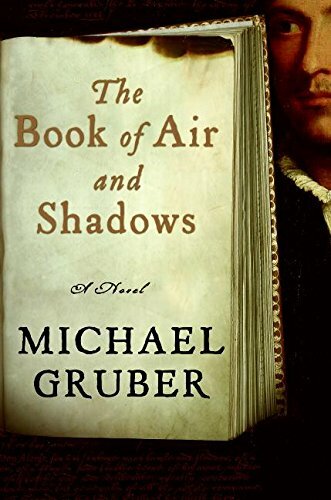 In this ingenious literary thriller from Michael Gruber, the lives of two men are changed forever by William Shakespeare and the letters of Richard Bracegirdle, a 16th-century English spy and soldier. Jake Mishkin, a Manhattan intellectual property attorney and a bit of a rake, goes on the run from Russian gangsters. Albert Crosetti, an aspiring filmmaker working for an antiquarian bookstore, finds that life is more exciting than movies—perhaps too exciting. Together, Mishkin and Crosetti travel to England in search of a previously unknown Shakespeare manuscript mentioned by Bracegirdle. Though the pace sometimes slows to allow Mishkin, Crosetti and Bracegirdle to divulge interesting aspects of their personal lives, these digressions only make the story more engaging. The suspense created around the double-crosses and triple-crosses works because of the close connection readers forge with Crosetti in particular. The mysterious murder of a Shakespearean scholar, shootouts in the streets of Queens and an unlikely romance all combine to make for a gripping, satisfying read. This book received a Starred Review in Publisher's Weekly and it gets a starred review from me as well. 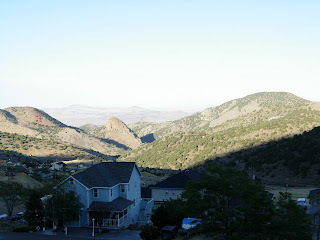 I took a long walk up to Virginia City from St. Mary's Arts Center. I have always been interested in this area, the foundation of our Battle Born state. 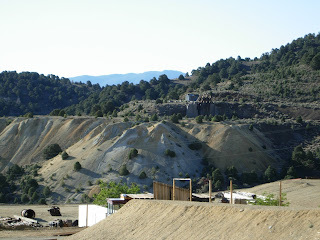 Mine tailings are part of the landscape. 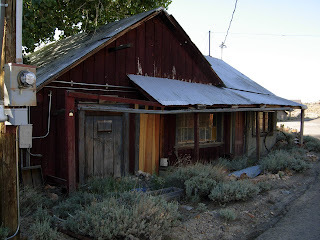 With modern technology, the ability to strip minerals from the ground isn't nearly as quaint as here, if this is quaint. The evidence of fire is clear from the flaccid chimney in the foreground. Notice the sheet metal roof on the right. 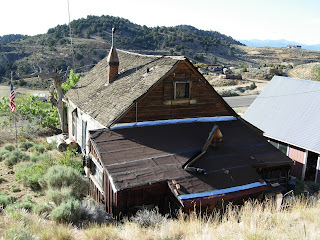 Mark Twain coined the term "Washoe Zephyr" when the harsh winds would rip through the area and tear off the roofs of the miners' homes. He loved a spoof. 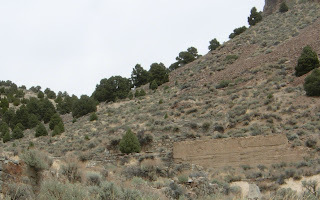 We still call those winds a Washoe Zephyr and there is nothing gentle or wafting about them. I thought this was funny - an obviously period structure and a power pole. Huh??? It's not been occupied in quite some time. This is a view east and it includes the funny little cone that has alway caught my eye. 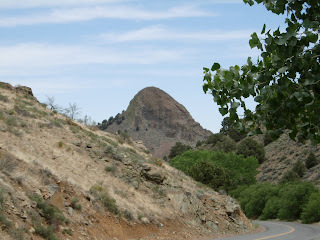 The cone appears in so many of my pictures that I decided to drive home down the Six Mile Canyon Road to see it for myself. I've wanted to make this drive ever since I moved here, and after I said my farewells, I pointed my car east, and away from home to finally see it. This is the route that more-or-less Adolph Sutro's tunnel took. What an interesting man. As an engineer he proposed the humanitarian drainage - many men died of scalding water - by an engineered tunnel to save the lives of miners, but as an abrasive foreigner who alienated nearly everyone he spoke to, he struggled for support. He finally managed to get his project financed and built, but the hurdles took so much time that when he was finally able to accomplish his visionary tunnel, the mines had started to fail. He was paid for his endeavor and took this payment to San Francisco where he became mayor and his name appears in many places. He doesn't appear to have been a lovable character, but he did purchase books on a huge scale. His legacy lives on in the Sutro Library, a subsidiary of the California State Library. His massive book collection was diminished by the 1904 earthquake and subsequent fire, but the surviving books were substantive enough to base an entire library on. And here is the cone I was chased with my camera. There wasn't a lot of traffic on the road so I stopped for pictures when I felt the demand or need. On the face of my funny cone is evidence of some kind of entire mill racings, bracings for an extraction process. I saw banks and banks of these supports. I can't guess what the in-business mill looked like. I'm feeling a bit of disconnect. Nisha says that she weaves to sew. Sewing is her first love. Her grandson is going to the Olympics in Beijing and was weaving the cloth for her Beijing Jacket. She cut fabric into 1/2" strips, did one shot of the fabric, followed by one shot of a novelty yarn in the same color harmony. You can see that the subtle floral pattern in the fabric is preserved in the weaving. 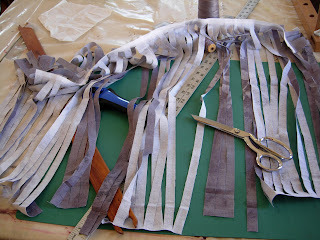 Please check out Sara's blog for more of the retreat and to see Lisa's astounding Nuno silk. Sara called it Golden Days, which they truly were. Ginger was my roommate. We hadn't met before but found our roommatemanship to be very compatible. We weren't allowed back into the studio after 10:00 because of noise to the rooms below, which is really bad if you're using a floor loom. So we visited, checked our emails and then read for a while which ended up being midnight. I only stay up that late at New Year's. It was like girls camp, but even better. She easily created this fabric while we all kibitzed, but she wasn't following a written pattern. She was making it up as she went. Later she sat down to write it out. It's going to appear in the winter issue of Knitters. Too much math. but unwove the old project. I'm working through exercises in Kirsten Blasbrook's book which I got from the library but am ordering it from Amazon. I'd like a little more experience in making mistakes before I actually look for a class. 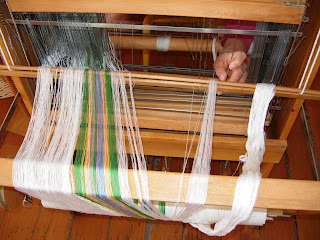 I love this shot of Linda warping her loom. The threads are so tiny and, oops, there's her hand. She just bought this was used loom and was disappointed to realize that she hadn't brought the beater bar, but since you don't need one to warp from back to front, she pushed on. 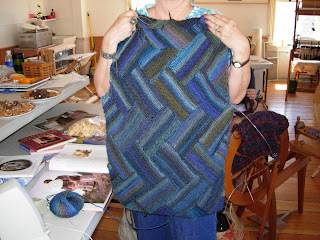 This is Eileen's shawl. Her local guild spun the yarn, dyed it with natural dyes, wove it and gave it to her when she was diagnosed in the early stages of breast cancer. The shawl is a demonstration of their love and support. I think it's a statement of the power of our relationships.